“This is excellent,” Kate said as she hopped down from the first class carriage onto the platform. “You were only six,” Jane said as they started moving towards a ramp leading down to street level. A Firefly locomotive pulls out from the Bath Great Western Railway station, 1846. “My lady?” Isabel, Kate’s maid, a small unobtrusive young woman, offered an umbrella. A grey day with a cool breeze and light rain, low clouds obscuring the hills, Jane and her maid (the lovely Lydia Pierce) each held an umbrella at the ready. Miss Pierce stood as tall as the average man, but favoured footwear that elevated her to significantly lofty heights for a woman. She was statuesque, wore fine clothes, styled her auburn hair with extravagant side ringlets, spoke softly, seemed melancholy, and seldom displayed any emotion. Kate accepted the protection from the weather without comment, and nodded her thanks to Isabel. The party stepped out of the station to the waiting hackney carriages, the servants occupying one, the Beaufort family following in another. “Take your time,” Earl Beaufort instructed the driver, then climbed in beside Jane. “Not the nicest day for our arrival, my lord,” Jane commented. “Doesn’t bother me in the least, my lady.” Lord Beaufort gasped his bride’s hand and grinned at her with a twinkle in his eye. Kate stared studiously out a window while her father and stepmother shared a brief passionate embrace. The wedding ceremony, performed two days previously, seemed to have taken place a week ago. Kate realized how tired she felt, settled back, and closed her eyes. Such tension and pressure had existed to ensure everything went smoothly. The conversations, people, families, food, wine, clothing, hair… it was all a blur. She thought there had been opportunities to visit with dear friends and countless acquaintances, but no time to have a genuine dialogue with any of them; not even her brother. They crossed Pulteney Bridge and soon rolled to a stop in a square, in front of a grand Georgian row house crafted of Bath stone. Their servants were waiting on the pavement, with travel coats, capes, and headdresses removed, the front door wide open. The half-dozen domestics who lived in the residence were all turned out in their uniforms, waiting to greet their guests. Earl Beaufort led the introductions, then proceeded with Jane into the front hall, then up to the first floor, which contained the drawing room and master bedchamber suite. Kate followed with Isabel, and they slipped away with one of the maids. She took them to rooms on the second floor for Kate’s use. The servants were housed on the third floor. “This house has gaslights!” Kate declared, when she took a moment to look at the fixtures. Isabel quickly set to work unpacking the luggage, Kate helping to put her gowns in the wardrobes provided. The day grew dark, rain falling in sheets, Kate feeling quite relieved to have a quiet dinner and retire early. She played with the gaslights for awhile, wishing her father would have the system installed in their London home. “We must stop by the Great Pump-Room and sign the reception book,” Earl Beaufort said. He walked with Jane on his elbow. Kate followed a few steps behind with Isabel, Miss Pierce bringing up the rear. The newly-weds had slept in and breakfasted late, leaving Kate impatient to get outside into what appeared to be the start of a beautiful day. They strolled around the abbey and neared the Great Pump-Room, entering an impressive hall through the front doors. A large number of elderly infirm ladies and gentlemen were being driven by servants in an astonishing variety of wheeled chairs. The sound of a band playing popular tunes came to them in waves as an inner door repeatedly opened and closed. The ladies stood together by a window while Lord Beaufort signed the reception book and leafed through a few pages. “Let’s have a look, shall we?” Jane said to Kate, and strode for the pump-room door. Kate followed while Isabel and Miss Pierce remained in the hall. Upon entering the pump-room the music and conversation reached an overwhelming level, crowds of people in animated discussions, many quaffing water from decidedly yellow-stained glass tumblers. Kate didn’t recognise anyone, and turned her attention to the décor: pairs of crystal girandoles on the sideboards, Corinthian pillars, a statue of Beau Nash, paintings of flowers, birds, shells, and fossils. Earl Beaufort joined them. “Tontine?” Kate asked, unfamiliar with the process. 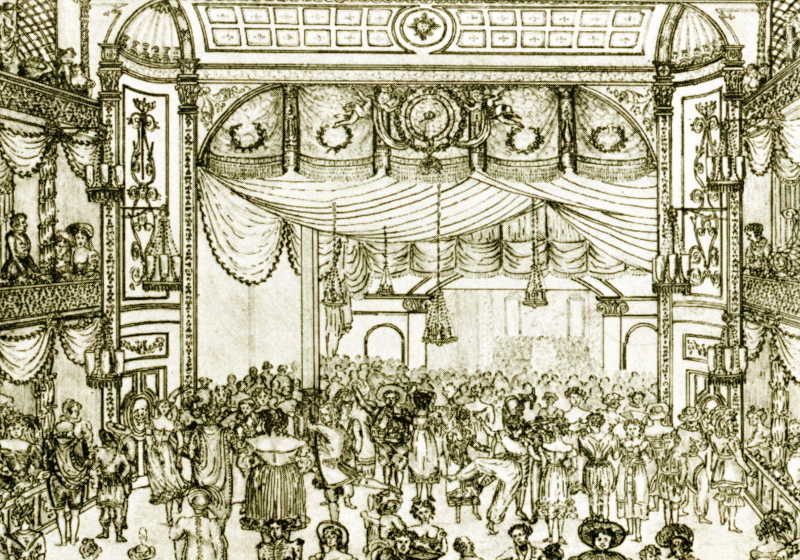 The interior of the Theatre Royal, Bath, circa 1820, depicting a lively fancy dress ball. “And the ball?” Earl Beaufort asked. “Miss Pierce?” Lord Beaufort prompted with an encouraging smile. Kate had noticed her stepmother’s maid, despite her low position, often received kind consideration from men, no matter their rank. Indeed, it was similar to the attention Kate received herself, the difference being the guarded delivery due to her position in the aristocracy; her clothing, accessories, and the accompaniment of a maid, her father, or footmen and carriage attendants, usually proclaiming her eminent position to all. “My lord?” Miss Pierce said softly with lowered eyes and a small curtsey. Kate knew both the maids heard what was discussed, but Miss Pierce acted as though she perceived nothing of the plans, feigning innocence of eavesdropping. Kate reiterated the itinerary and invitation to explore Sydney Gardens. Miss Pierce accepted with another graceful curtsey. They walked as a group back to the house then separated, Kate and the maids continuing up Great Pulteney Street. 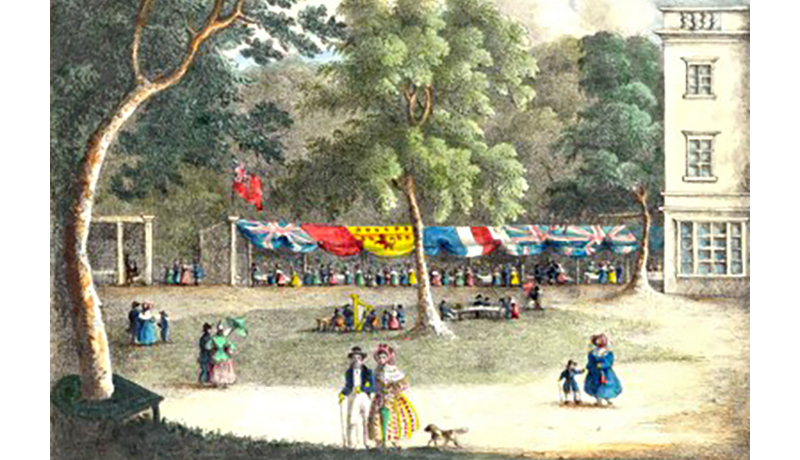 Kate and Isabel hooked elbows and talked cheerily of Bath and the attractions as they approached the Sydney Hotel, a residential inn and water cure establishment that served as the entrance to the garden; the tunes of an orchestra reached beyond the hedges and walls. “A man is following us,” Miss Pierce said from behind them in a low voice. Kate and Isabel spun abruptly and peered back at their route; the pavement and rows of uniform houses lining the street. “I see no one of that description.” Kate started to scheme, and thought herself very clever. “I have an idea.” She led the maids to the hotel while slipping a little coin purse from her gaily coloured satin reticule. “A table in the garden,” she instructed a doorman, attempting an authoritative voice and handing him a sixpence. He led them through to the back of the hotel where dozens of well dressed ladies, gentlemen, and a few children, were engaged in al fresco dining, conversation, and appreciation of the string orchestra (which played from a platform at the rear of the building). Kate requested a table to one side of the backyard, at the far end of a crescent shaped row of dining stalls, and ordered tea and sweets. They sat at a small round table and arranged their flounced skirts and capes, Kate in fur trimmed plush velvet with lavish embroidery, the maids in plain velvet and fine wool. This postcard from 1836 nicely illustrates the crescent of dining stalls that once existed at the rear of the Sydney Hotel (Holburne Museum). “Indeed, no, my lady,” Miss Pierce said firmly, only a brief flash of shock displayed by her large heavily lidded eyes. Kate, initially a trifle embarrassed by her own rather bold suggestion of a past and perhaps secret lover, shuddered at Miss Pierce’s ensuing candour and did not pursue the subject. It may have been the first time Kate had heard the maid string more than a couple short sentences together. She wondered what man or men Miss Pierce had previously encountered to lead to such revelations. Their refreshments arrived. Glad for a distraction, Kate produced her purse again and gave the serving girl half crown. The girl smiled and scampered away. “That was too much!” Isabel hissed at Kate. After a few minutes, Isabel poured the tea for them. They sipped in silence and scrutinized every man who passed by. There were tall men, and a couple men in black, but no one who met the full criteria. At one point, a trio of stylishly attired young gallants (in shades of pink and grey, contrasted by dark stripes and tartan waistcoats) approached with confident smiles, and asked politely if they might join them, but Isabel quickly sent them on their way. After a fruitless hour, with many cakes, tarts, and biscuits consumed, washed down by countless cups of tea, Kate lost patience. They followed a serpentine gravel lane, passing some couples brandishing battledores and banging a scarlet-feathered shuttlecock back and forth, then came upon a set of swings. Kate and Isabel each took a seat and swung lazily while Miss Pierce stood like a sentinel. The trio of gallants reappeared, sat on a bench not far away, and made no secret of watching them. Kate stared at one of the men for a moment, his blonde hair and bright smile, and recalled the under-gardener she had once seen naked, in the throes of passion with the village farrier’s eldest daughter. The man clearly sensed her attention, stood, and touched the silver knob of his delicate cane to the brim of his shiny grey top hat. She shook from her reverie and leapt from the swing. “Impertinent fellows,” Miss Pierce said mildly. They promenaded by a stone pavilion with a thatched roof and stopped on a bridge over the deep rail cutting. They strolled to a cast iron bridge over the canal and looked at the swans. Kites flew high over the centre of the garden, and sparrows flitted about on the breeze. “There!” Miss Pierce said abruptly and pointed. Kate instinctively followed the direction indicated and scanned the distance. For a fleeting moment, a tall thin man in black, darted from a shadow to the shelter of a hedge. He wasn’t running, but moved with a lightning step through a band of sunlight. Without hesitating, Kate gathered her skirts and went in pursuit. “My lady!” the maids called in chorus. Kate sprinted back over the rail bridge, across a small park, and through a gap in a hedge, ignoring the few people she passed. She slowed to assess the situation, then ran towards an octagon shaped temple. She rounded the structure while trying to look in every open area. The man was nowhere to be seen. Kate stopped and took a few calming breaths. Damn, I thought I’d catch the scoundrel. Where is Isabel? Feeling hot, she took off her heavy velvet bonnet and wandered around the temple. Isabel came bustling up to her at a jog. Miss Pierce strode up to them in a decorous fashion. “You cannot run in those French boots?” Kate asked derisively. “We’re done with exploring, then?” Isabel asked. Kate walked between the maids down the centre lane of the garden, searching left and right as they went. The three gallants swaggered from a pavilion and fell into step behind them. Isabel rounded on the men, causing them to halt with startled expressions. “Did any of you see a tall man in black following us?” she barked. 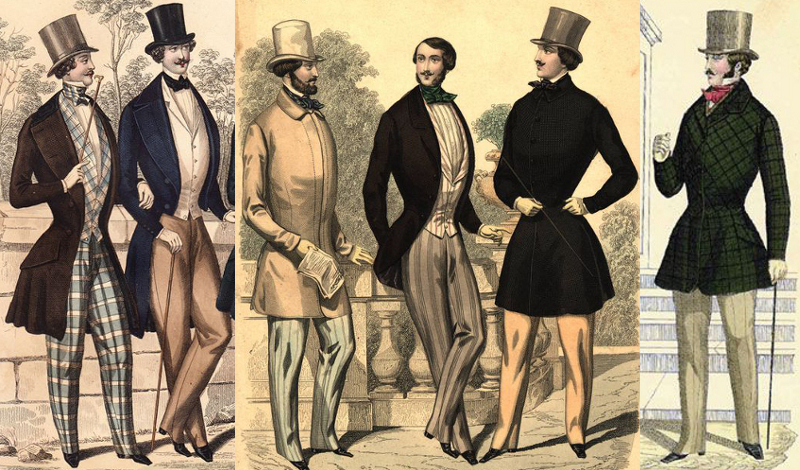 Stylishly attired gentlemen, fashion plates, 1844 – 48. The men looked at each other with raised eyebrows. One shrugged helplessly. Kate and the maids spun on their heels and marched off, leaving the gallants crestfallen. Kate noticed Miss Pierce had remained silent with downcast eyes in the presence of the men. “Are you quite all right, Lydia?” she asked. They proceeded to the hotel, made use of the ladies’ room, then approached a watchman at the front gate. Isabel explained what had happened. He appeared somewhat interested and apologised for any upset or inconvenience suffered. He didn’t remember seeing a tall man in black, or know of any troublemakers recently dogging ladies in the gardens. Kate, Isabel, and Miss Pierce, hooked elbows and walked down Great Pulteney Street to their lodgings in Laura Place, a safe little determined troop, each looking back occasionally for any pursuers; of which, there were none.